Swiss beauty brand La Colline has launched an exclusive on-flight promotion. 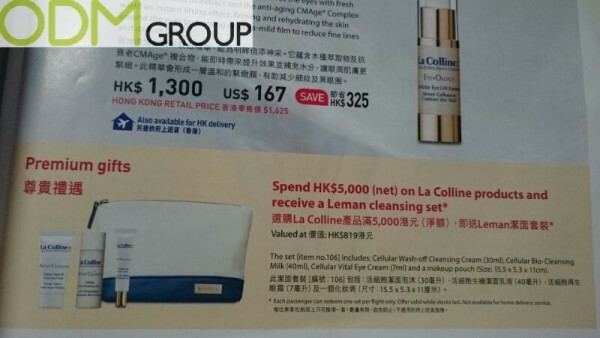 For every purchase of their products over HK$5000, customers can receive a redemption gift – Leman cleansing set. This premium gift contains cleansing cream, cleansing milk, eye cream and a makeup pouch and has the value of HK$819. The special edition travel set is available only when purchasing on board. How can redemption gift impact the promotional campaign? Firstly, the redemption gift used in this campaign is of high quality, therefore the perceived value of it will be extremely high. Hence customer’s satisfaction will rise significantly from the purchase, gift and the brand experience overall. Besides, customer loyalty is also influenced as the redemption gift encourage people to a repeat purchase. It is also advantageous to make a lasting impact on customers and to gain considerable brand recognition. Using new products as a redemption gift is beneficial for the cosmetics companies as they stimulate people for a trial of the new product. From long-term perspective, it will encourage people to buy these products, therefore securing the sales in the future. Hence redemption gift is useful not only to promote the product and stimulate the sales, but also the brand itself. Additionally, positive word of mouth might work as a tool to generate more leads from existing customers of the brand. Feel free to contact the ODM Group to learn more about redemption gift or other promotional products, which you can include in your marketing strategy. We have years of experience with sourcing promotional products for companies all over the world. In addition, if you’re interested in related study cases like this, then please visit our gift with purchase page, with tailored advice on this topic.